Cut the chicken breasts into cubes, about one inch wide. Heat a little of the oil in a wok or medium-sized frying pan over medium heat. Add the beaten eggs and scramble them, mixing the eggs in the pan well. When cooked, transfer to a dish and set aside. In the same wok or pan, heat the rest of the oil and fry the chicken, stirring occasionally until golden on all sides. Push the chicken to the sides of the wok and add the garlic and ginger in the center. Sauté for three minutes, constantly stirring to avoid burning. Incorporate the red bell pepper and then the white rice. Fry the ingredients well and remember to keep stirring. Add-in the snow peas and broccoli; continue to sauté. Lastly, add the soy sauce and sesame oil. Turn off the heat and sprinkle with the sliced green onion. Serve immediately. 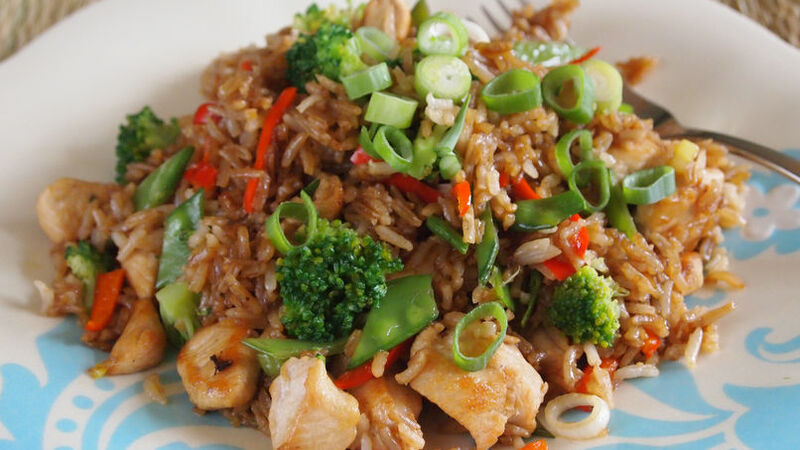 To make great chaufa rice, start with cooked white rice that has been chilled and prepared without salt. You can even use the leftover rice in your own fridge- it will absorb the flavors better when making this dish. Add carrots cut into small ‘matchsticks’ to give your chaufa more color. Sprinkle with toasted sesame seeds if you wish. Chifas are popular restaurants that serve Chinese food in Peru. Every time there is something special to celebrate, or a get-together planned with friends, people always say, “let’s go to un chifita” for a suculent Chinese-style banquet. Several of these marvelous dishes are very easy to make at home, with as many variations as you can imagine! In the case of Chinese fried rice or chaufa, it can be made with barbequed pork–the traditional way–or with chicken, chicken and sausage, seafood, shrimp, or only with vegetables for a vegetarian version. It’s a dish that’s so rico and easy to prepare, we have “Peruvanized” and adopted it as our own. There isn’t a Peruvian household that doesn’t make chaufa frequently, even substituting quinoa in place of rice to make a spectacular chaufa de quinoa.